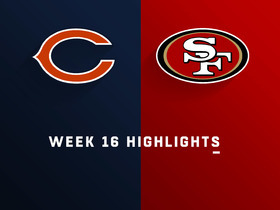 Analysis: With the 49ers trailing for much of the second half, they were forced to throw the ball frequently, resulting in Kittle leading the team with 12 targets. His performance could've been better, but when he was open for a potential touchdown in the end zone, a defender grabbed his arm, keeping him from securing the pass. Despite a number of difficult matchups, he's only been held to fewer than 50 yards once over his last nine games. Kittle caught six of nine passing attempts for 70 yards in Sunday's 43-16 loss to the Seahawks. Analysis: Kittle tied for the team lead in targets but finished third in receiving yards in the contest, as Dante Pettis and Jeff Wilson both had big games. The Iowa product was also held out of the end zone for the third straight game, matching his longest drought of the year. Nevertheless, Kittle remains a top-tier tight end and will look to break that streak with a nice Week 14 matchup at home against Denver. Kittle brought in six of 12 targets for 48 yards in the 49ers' 27-9 loss to the Buccaneers on Sunday. Analysis: Kittle padded his line some in the second half, but his overall production had to be considered somewhat of a disappointment considering the 49ers were missing both Marquise Goodwin (personal) and Pierre Garcon (knee). The second-year tight end's reception total did lead the team on the afternoon, and it equaled his second-highest tally of the season. Kittle will look to up his numbers in a Week 13 matchup against the Seahawks. 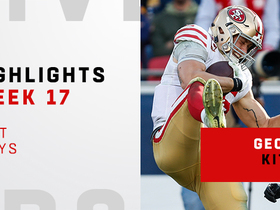 Kittle caught nine of 10 targets for 83 yards in Monday night's 27-23 loss to the Giants. Analysis: Kittle was clearly quarterback Nick Mullens' security blanket, hauling in just about everything thrown his way. In doing so, he led the Niners in all the major receiving categories, which has become a foregone conclusion over the course of this season. 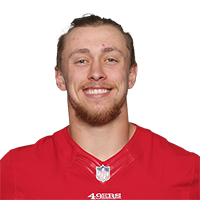 With at least 75 yards in seven (of 10) outings thus far, Kittle will now use San Francisco's bye to help his prior chest contusion heal before facing Tampa Bay in Week 12. Kittle (chest) doesn't carry an injury designation into Monday's game against the Giants. Analysis: Kittle's status was never really in jeopardy despite him donning a non-contact jersey in every practice this week, as the 49ers have simply been trying to preserve the health of one of their few remaining consistent weapons in the passing game. The tight end has been one of the top fantasy options at his position this season, corralling 41 of 61 targets for 692 yards and three scores through nine games. Kittle (chest) wore a non-contact jersey for the third straight day at practice Saturday, Cam Inman of The San Jose Mercury News reports. Analysis: Inman suggests Kittle is still expected to play Monday against the Giants despite donning the aforementioned apparel, but an official injury designation later in the day should provide some clarification on the tight end's status moving forward. Garrett Celek, who missed Thursday's practice due to non-injury related reasons, would stand to see a significant rise in snaps in the event Kittle misses any time. Kittle (chest) was a limited participant at Friday's practice, wearing a non-contact jersey for the second straight day, Nick Wagoner of ESPN.com reports. Analysis: Kittle reportedly is just dealing with a chest contusion, though it's apparently enough of an issue to impact his practice schedule on a long week following a Thursday game. He nonetheless seems to be on track for Monday's game against the Giants, even if he's once again limited when the Niners practice Saturday. Garrett Celek would be positioned for an expanded pass-catching role if Kittle were to suffer a setback before Monday. Kittle (chest) wore a blue non-contact jersey during his limited practice Thursday, Cam Inman of The San Jose Mercury News reports. Analysis: A chest contusion is to blame for the cap on Kittle's practice reps this week, but the concern isn't expected to impact his availability for Monday's contest against the Giants. Assuming he ditches the designation prior to the game, he'll seek to build upon his 41-692-3 line from the first nine outings of the campaign. Kittle (chest) was a limited participant at Thursday's practice, Cam Inman of The San Jose Mercury News reports. Analysis: Kittle has tended to shoulder and knee injuries already this season but hasn't missed any game action as a result. With extra time to prepare for the 49ers' Week 10 matchup with the Giants, there isn't much worry about Kittle toughing out the chest concern and suiting up Monday. In his second season, Kittle ranks third behind Travis Kelce and Zach Ertz in receiving yards per game (76.9) among NFL tight ends, making him a must-start on a weekly basis. Kittle brought in all four of his targets for 108 yards and a touchdown in the 49ers' 34-3 win over the Raiders on Thursday. Kittle caught five of eight targets for 57 yards during Sunday's 18-15 loss to the Cardinals. Analysis: Kittle finished behind only Kendrick Bourne in targets, catches and yardage as he went over 50 receiving yards for the sixth time in eight games. He's begun to draw additional attention from opposing defenses, but his rapport with C.J. Beathard makes him a useful fantasy starter most weeks. Kittle will square off with the Chiefs on Thursday. Kittle caught five of eight targets for 98 yards and a touchdown during Sunday's 39-10 loss to the Rams. Analysis: Kittle led the team in targets, catches and receiving yardage, thanks in large part to a long gain of 35 yards. He also got into the end zone for the second time this season on a 10-yard strike in the second quarter. Kittle has emerged as one of the top pass-catching tight ends in the NFL this season and is on pace for over 1,200 yards while catching passes from former Iowa teammate C.J. Beathard. He'll look to build on this productive outing next Sunday against the Cardinals. Kittle (knee) doesn't carry an injury designation into Sunday's game against the Rams, Nick Wagoner of ESPN.com reports. Analysis: Despite being nicked up for most of the season, Kittle has yet to actually miss a game. The Rams haven't allowed an opposing tight end to score a touchdown through the first six weeks of the season, but they have given up 8.0 yards per target to the position, thanks in large part to a monster outing from Oakland's Jared Cook back in the season opener. Kittle (knee) was listed as limited on Wednesday's estimated injury report, Matt Barrows of The Athletic reports. Analysis: Kittle was held below 75 yards for just the second time this season Week 6, corralling four of six passes for 30 yards in Monday's 33-30 loss to Green Bay. Due to his prior production, Kittle can be forgiven for a sub-optimal outing on occasion. Assuming he puts the knee injury behind him yet again, he'll face a Rams defense Sunday that has given up 8.0 yards per target but no touchdowns to tight ends through six games. Kittle (knee) caught four of six targets for 30 yards in Monday's 33-30 loss to Green Bay. Analysis: Kittle had been dealing with a minor knee injury during practice this week, but he started and finished Monday's contest. The tight end was tied for the team lead in targets, but Marquise Goodwin served as C.J. Beathard's preferred deep threat in this one. Kittle may cede some big-play opportunities so long as Goodwin stays healthy, but he remains a key contributor in San Francisco's passing game heading into Sunday's matchup with the Rams. Kittle (knee) is active for Monday's contest at Green Bay. Analysis: Limited in practice all week due to a knee injury, Kittle nonetheless will be available against a Packers defense that has allowed 8.3 YPT and no touchdowns to tight ends this season. Kittle (knee) is expected to suit up Monday in Green Bay, Adam Schefter of ESPN reports. Analysis: Kittle's practice reps were limited all week due to the knee injury suffered Oct. 7 against the Cardinals. That said, he's slated to brush off the issue Monday and build upon his 23-399-1 start to the campaign. Kittle (knee) is officially listed as questionable for Monday's game against the Packers, Cam Inman of The San Jose Mercury News reports. Analysis: Kittle was a limited participant again at practice Saturday as he deals with the knee injury suffered in last Sunday's loss to the Cardinals. The fact the 25-year-old participated in practice throughout the week makes him seemingly on track for Monday's game. Assuming Kittle does suit up, he could be in line for a heavy workload with a plethora of San Francisco position players on the injury report. Kittle (knee) remained limited at practice Friday, Nick Wagoner of ESPN.com reports. Analysis: Kittle hurt his knee during last week's 28-18 loss to the Cardinals, but it didn't stop him from catching five of seven targets for 83 yards. He seems to be on track for Monday's game in Green Bay, potentially headed for a big workload with the 49ers running thin on healthy skill-position players. Matt Breida (shoulder/ankle), Pierre Garcon (shoulder/knee), Trent Taylor (back) and Dante Pettis (knee) all missed practice Thursday and Friday. Kittle (knee) was limited at Thursday's practice, Nick Wagoner of ESPN.com reports. Analysis: Coach Kyle Shanahan was of the belief Kittle wouldn't practice Thursday due to a knee injury stemming from Sunday's loss at Arizona. Clearly, Kittle bucked those expectations and may be ahead of the schedule set by the 49ers' training staff. No matter, his status should continue to be watched due to his standing as the NFL's third-leading tight end in terms of receiving yards (399 in five games). Coach Kyle Shanahan said that Kittle (knee) wouldn't participate in Thursday's practice, Cam Inman of The San Jose Mercury News reports. Kittle suffered a knee injury in Sunday's loss to the Cardinals, according to Nick Wagoner of ESPN.com. Analysis: It is unclear when Kittle suffered the injury, but he was able to stay in the game and finish with 83 yards on five receptions. Unless he suffers a setback, the athletic tight end's status for next week's matchup against the Packers doesn't appear to be in jeopardy. Expect more clarification when injury reports are released later this week. Kittle caught five of seven targets for 83 yards in Sunday's 28-18 loss to the Cardinals. Analysis: Kittle hasn't skipped a beat since C.J. Beathard replaced Jimmy Garoppolo (knee) as San Francisco's starting quarterback, accumulating 11 catches on 15 targets for 208 yards and a touchdown over the last two weeks, The athletic tight end will look to stay on a roll in Week 6 at Green Bay. Kittle caught six of eight passes for 125 yards and a touchdown in Sunday's 29-27 loss to the Chargers. 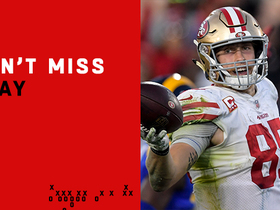 Kittle corralled five of seven passes for 79 yards Sunday. He also caught a two-point conversion in a loss to the Chiefs. Kittle pulled in two of his four targets for 22 yards in Sunday's 30-27 win over the Lions. Kittle brought in five of nine targets for 90 yards in the 49ers' 24-16 loss to the Vikings on Sunday. Kittle (shoulder) wasn't listed Wednesday on the 49ers' Week 1 injury report. Analysis: Kittle appeared to log every practice rep Monday, but Wednesday's session was accompanied by the first injury report of the regular season, confirming what was already assumed about the tight end's health. With his separated right shoulder in the rear-view mirror, Kittle can focus on holding down the fort at tight end for the 49ers in Week 1 and beyond. Kittle (shoulder) appeared to practice fully Monday, Matt Barrows of The Athletic Bay Area reports. Analysis: After suffering a separated right shoulder in preseason Week 1, Kittle spent most of the rest of August in recovery mode. Monday's session marked almost a week back in action for the tight end, and it seems as if he handled a good portion of team drills. The 49ers will clarify whether he's handling all practice reps once they hold their first regular-season practice Wednesday, after which he'll prepare as the team's No. 1 TE following a rookie line of 43-515-2 in 2017. 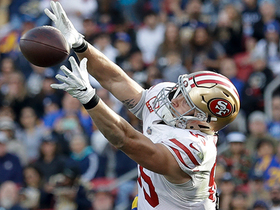 Kittle (shoulder) returned to practice Saturday, Mat Maiocco of NBC Sports Bay Area reports. Analysis: After separating his right shoulder in the first week of the preseason, Kittle seems to be on track for full participation when the Niners release their initial injury report for Week 1 on Wednesday. The second-year pro is expected to serve as the team's top pass-catching option at tight end, though he may share snaps with Garrett Celek in the season opener against Minnesota. Kittle (shoulder) participated in the open portion of Tuesday's practice, Cam Inman of The San Jose Mercury News reports. Kittle (shoulder) is doing individual conditioning work at Tuesday's practice, Cam Inman of The San Jose Mercury News reports. Kittle won't suit up for any more preseason games after separating his shoulder, but 49ers coach Kyle Shanahan expects the tight end to be ready for Week 1, Adam Schefter of ESPN reports. Analysis: Although there's no structural damage to Kittle's shoulder, he'll need rest to ensure it heals correctly. Kittle had 43 receptions for 515 yards and two touchdowns in his rookie campaign, with his 6-foot-4, 250-pound frame helping him earn 16 red-zone target, including six from Jimmy Garoppolo. The Niners will turn to Garrett Celek as their top tight end for the rest of August. Further medical testing revealed no tears or structural damage on Kittle's separated right shoulder, Ian Rapoport of the NFL Network reports. Analysis: Kittle prematurely exited Thursday's preseason opener with an unspecified shoulder injury, but it seems the 49ers offense dodged a bullet. While the tight end could still be held out for the remainder of the preseason, there doesn't seem to be any concern over Kittle's availability for Week 1 of the regular season. Kittle (shoulder) isn't expected to practice next week or play in the 49ers' second preseason game, Eric Branch of The San Francisco Chronicle reports. Analysis: Kittle was removed from Thursday's preseason game against Dallas after taking a hard hit in the first quarter, later walking to the locker room with his right arm pinned to his body. A serious injury would be a major blow to the San Francisco offense, after Kittle finished his rookie season with 194 receiving yards over the final three weeks. Garrett Celek will step in as the 49ers' top tight end while Kittle is unavailable. Kittle injured his shoulder and will not return to Thursday's preseason opener against the Cowboys, Matt Maiocco of NBC Sports Bay Area reports. Analysis: Kittle came up holding his right shoulder after running downfield for a deep ball. The exact nature of his injury isn't clear. In Kittle's absence, Garret Celek will take over as the 49ers' No. 1 tight end. Kittle focused on strengthening his smaller muscles in the offseason, hoping to avoid the nagging injuries that plagued his rookie campaign, Curtis Pashelka of The San Jose Mercury News reports. Kittle hauled in four of his six targets for 100 yards in Sunday's season-finale victory over the Rams. Kittle caught three passes on three targets for 42 yards and one touchdown against Jacksonville on Sunday. Analysis: Three targets isn't normally enough to get it done reliably, but Kittle has generally shown well as a rookie, and he was an important contributor in the 49ers' exciting upset of the Jaguars. The rookie has a more positive long-term outlook than most young tight ends generally, let alone those drafted in the fifth round like Kittle was. With QB Jimmy Garoppolo looking like a promising foundation of the new era in San Francisco, Kittle's future appears favorable. Kittle caught four passes (five targets) for 52 yards in Sunday's 25-23 win over the Titans. Analysis: This was arguably the rookie's second-best performance of the season. Fantasy owners should be wary of the production as Kittle is still clearly second on the tight end depth chart, as evidenced by his 28 snaps compared to Garrett Celek's 46. Celek also outclassed Kittle in terms of production with 63 yards and his fourth touchdown of the season. The Jaguars are the fourth-stingiest defense against opposing tight ends, so Kittle shouldn't be considered a standard-league option next week. Kittle caught two passes (two targets) for 10 yards in Sunday's victory over the Texans. Analysis: This was the second consecutive week where we saw veteran Garrett Celek not only out-snap the rookie (61 to 20), but also outpace him in production as well. The developing timeshare was already damaging to Kittle's chances of being a standard league fantasy asset, but it now appears that he has become the clear-cut backup to Celek going forward. Kittle caught two passes (three targets) for 20 yards in Sunday's victory over the Bears. Kittle (ankle) doesn't have a designation on the final injury report for Sunday's game against the Bears. Kittle (ankle) was limited at Wednesday's practice, Eric Branch of the San Francisco Chronicle reports. Kittle (leg) saw just two targets against the Seahawks on Sunday, grabbing one for 14 yards in a losing effort. Kittle (leg) does not have a designation on the final injury report for Sunday's game against the Seahawks. Kittle (leg) was listed as a full practice participant Thursday, Eric Branch of the San Francisco Chronicle reports. Analysis: Kittle injured his leg Week 9 and was promptly ruled out for the ensuing contest. 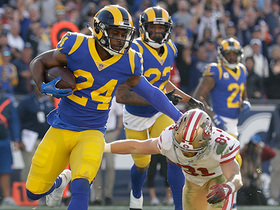 After utilizing the 49ers' bye, he progressed from limited Wednesday to uncapped one day later, clearing him to suit up Sunday against the Seahawks. Considering he leads all San Francisco tight ends in usage -- 42 targets versus 21 total between Garrett Celek and Cole Hikutini (knee) -- Kittle shouldn't have a problem reincorporating himself into the offense. Kittle (leg) will be limited at Wednesday's practice, with head coach Kyle Shanahan indicating that he's hopeful the tight end can return for Sunday's game against the Seahawks, Eric Branch of the San Francisco Chronicle reports. Analysis: Garrett Celek made the most of Kittle's absence in a 31-21 win over the Giants in Week 10, catching four of six targets for 67 yards and a touchdown. 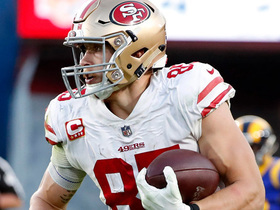 Coming out of a bye week, the San Francisco tight ends will face a much tougher task, regardless of whether it's Kittle or Celek leading the charge. Kittle (leg) has been ruled out for Week 10's matchup with the Giants, Cam Inman of The Mercury News reports. Analysis: Kittle was forced to leave Sunday's loss to the Cardinals with a leg injury, but he promptly returned to action and finished with three receptions (five targets) for 27 yards. The rookie's leg injury appears to be more serious than expected following an early out designation for Week 10. Garrett Celek should receive the start against the Giants on Sunday. Kittle (leg) returned to Sunday's game against the Cardinals, Darren Urban of the Cardinals' official site reports. Analysis: No. 3 tight end Cole Hikutini went down with a knee injury a few plays after Kittle, so his return was timely. Kittle will slot back into the top tight end role with rookie C.J. 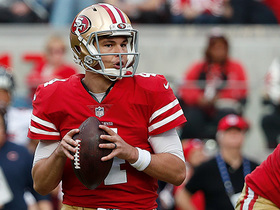 Beathard under center for the 49ers. Kittle suffered a leg injury Sunday against the Cardinals and is questionable to return. Analysis: The rookie fifth-round pick is listed as the 49ers' No. 1 tight end, but he's only posted one touchdown, despite being targeted 10 times in the red zone through eight game. Expect Garrett Celek to see an increase in his snaps while Kittle sits out. 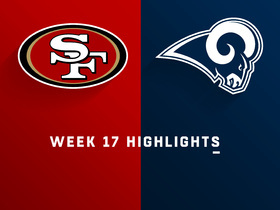 Watch complete highlights from the Week 17 matchup between the San Francisco 49ers and Los Angeles Rams. 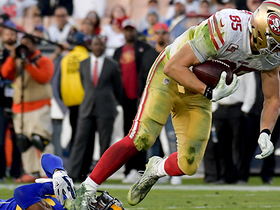 Watch the best plays from San Francisco 49ers tight end George Kittle's record-setting day in his Week 17 matchup against the Los Angeles Rams. San Francisco 49ers tight end George Kittle takes a short pass 25 yards. 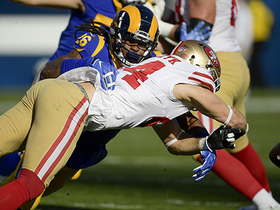 San Francisco fullback Kyle Juszczyk loses the ball on a first down extension and the Los Angeles Rams recover. San Francisco 49ers quarterback Nick Mullens bides his time to find tight end George Kittle downfield for 35 yards.